For an animated adventure with a furry twist, we head to 2016’s The Secret Life of Pets. The tale revolves around the non-human inhabitants of a New York apartment building, with an emphasis on a Jack Russell terrier named Max (voiced by Louis CK). Max lives a highly contented life – until his devoted owner Katie (Ellie Kemper) changes the residential circumstances. Katie brings a large, shaggy pooch named Duke (Eric Stonestreet) into their abode, and Max reacts negatively to the competition. During their daily outing, Max and Duke bicker, and they find themselves away from their dog-walker. Because of this, both dogs end up in the pound. We follow their attempts to return home, with all the challenges they face along the way. 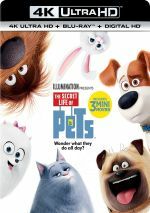 Going into Pets, I came with one notable concern: that its trailer would encompass virtually all of the film’s cleverness. The promos played up the literal aspects of the title, as these showed what the animals did when their humans went to work. The trailers presented fairly funny material, and I feared that the rest of the movie would lack much inspiration. While I can’t claim that Pets delivers a great animated comedy-adventure, it does manage to assuage those fears. Originally I figured the story would revolve almost entirely on the animals’ lives within their domesticated abodes and the film would deliver laughs via anthropomorphic silliness and a general Toy Story-esque vibe. That doesn’t become the case, though, as most of the movie concentrates on the journey Duke and Max take, with a lot of material connected to the supporting characters. In truth, Max and Duke can feel like secondary roles at times, as they tend to motivate action more than lead the charge. Yeah, those two dogs remain the focal point, and they do develop as matters go. However, neither ever becomes especially interesting, and we can tell that the filmmakers prefer to focus on the other animals. Which seems fine with me, as those supporting personalities offer the most fun. I seem to recall that Kevin Hart got negative reviews for his turn as Snowball, the psychotic bunny who heads the Flushed Pets, an animal army bent on revenge against the humans who abandoned them. If Hart did receive criticism, I can’t quite figure out why, as I think he becomes the star of the show. In a movie that could easily become sappy and soft, Hart provides a delightfully anarchic kick to the proceedings. Hart invests in the role and makes Snowball a consistent, unhinged hoot. In a smaller part, Albert Brooks also adds comedic menace to his role as Tiberius, a hawk who needs to repress his predatorial instincts to help the animals. Brooks gives the part a charge that works, as he makes Tiberius a witty role with just a smidgen of darkness attached. The remainder of a strong cast also adds life to Pets - and largely becomes the reason the movie entertains as much as it does. As I think about Pets, I find it hard to spotlight anything else it does especially well. Even with the animal revolution elements, the story doesn’t seem like anything special, and various events proceed in a predictable manner. So I come back to the cast as the factor that lifts the movie to “pretty good” status. While I do enjoy Pets, I still can’t elevate it above “B+” territory. The film offers consistent entertainment but it lacks the depth and originality that’d put it on a par with recent animated greats like Inside Out or Up. 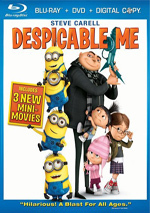 Still, Pets works better than its peers from Illumination Entertainment such as Minions and the Despiable Me movies. Heck, it’s probably as good as summer 2016’s Pixar release, Finding Dory - and I must admit I had more fun with Pets. It’s got just enough comedy and excitement to make it a good ride. The Secret Life of Pets appears in an aspect ratio of approximately 1.85:1 on this Blu-ray Disc. As I expected, the transfer looked terrific. Pets came with a palette that mildly emphasized teal, with a general pastel sense as well. The colors showed a good sense of vividness and worked well. Blacks were dark and deep, while low-light shots offered nice clarity and smoothness. This became an appealing visual presentation. With Pets, we get a Dolby Atmos soundtrack. Downconverted to Dolby TrueHD 7.1, this mix offered a lively soundscape, especially during the action sequences. Those fleshed out the spectrum in an involving way and gave us nice chances for movement. This allowed the surrounds to play an active role. The track worked well enough in the early stages but it picked up more as it went, especially as the film neared its climax. The various channels got a good workout in this engrossing soundscape. As we shift to extras, we find three mini-movies. These include Norman TV (4:01), Weenie (4:05) and Mower Minions (4:27). Norman focuses on the adventures of the guinea pig who wanders the apartment complex’s air ducts, while Weenie offers a tale that involves the anthropomorphic hot dogs Max and Duke see at the meat plant. Both are cute but not great, though Weenie comes with an appealing sense of weirdness. A short that ran before theatrical showings of Pets, Mower shows attempts by the Minions to earn money to buy a blender. Though I’ve never been a big fan of the Minions, Mower works pretty well, as they’re fun enough for a short like this. A featurette tells us about the Making of the Mini-Movies. It runs seven minutes, 23 seconds and offers comments from Pets director Chris Renaud, producer Janet Healy, Illumination founder/CEO Chris Meledandri, Norman TV directors Habib Louati and Boris Jacq, Mower director/co-writer Glenn McCoy, Mower director Bruno Chauffard, CG supervisor Benjamin Le Ster, Weenie directors/co-writers Cinco Paul and Ken Daurio and animation supervisor Bastien Laurent. With barely seven minutes to devote to three shorts, no one should expect much substance from “Making”. Still, it tosses out a few good insights, so it gives us a passable overview. The remaining components look more directly at Pets. Meet the Team encompasses five short clips with a total time of eight minutes, 43 seconds. In these, we hear from Meledandri, Healy, Renaud, co-director Yarrow Cheney, and co-writer Brian Lynch. We get info about the film’s roots and development, story/character choices, and a few notes about the filmmakers. While we locate a few nuggets of value, much of the material just praises the participants. Next we find the three-minute, 47-second Animals Can Talk. It involves actors Kevin Hart, Lake Bell, Bobby Moynihan, Eric Stonestreet, and Jenny Slate. They tell us a little about their acting choices. Despite the show’s brevity, it gives us a couple of useful tidbits. With All About the Pets, we find a six-minute, 26-second reel with Hart, Stonestreet and animal trainer Molly O’Neill. We see the actors with a few animals as they “research” for the movie. This gives us basics about various animals but largely acts to promote the film. After this comes Hairstylist to the Dogs. It lasts three minutes, 41 seconds and features Stonestreet with pet groomer Jess Rona. This gives a look at how dogs get groomed. It’s another largely substance-free piece. How to Make an Animated Film goes for four minutes, 13 seconds and includes info from Healy, Meledandri, Lynch, Renaud, Hart, Cheney, Stonestreet, production designer Eric Guillon, and composer Alexandre Desplat. We hear a little about character topics and design as well as music. Again, this becomes a minor diversion without a lot of information behind it. In the four-minute, 46-second Anatomy of a Scene, we hear from Meledandri, Healy, Cheney, Chauffard, modeling character supervisor Jerome Gordon, hair and fur character supervisor Loic Salmon, animation directors Jonathan Del Val and Julien Soret, compositing supervisor Celine Allegre and layout supervisor Regis Schuller. “Anatomy” looks at a few details involved with one specific movie sequence. Some decent material results. Finally, we locate The Best of Snowball. This one-minute, 15-second compilation simply collects snippets of the film’s bunny character. It’s largely a waste of time. A Music Video for Bill Withers’ “Lovely Day”. This pairs movie characters with lyrics to create a wholly forgettable video. We also get a Sing-Along for the version of “We Go Together” at the hot dog factory. It just takes the movie scene and adds lyrics, which makes it pretty useless. A few short bits finish the set. We get three snippets that show Brian the Minion on Pets. 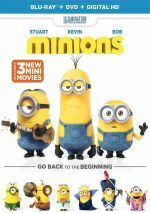 With a total time of two minutes, 46 seconds, we view Minions as they watch Pets and act silly. The snippets fail to offer much entertainment. GoPro Secret Life of Pets runs two minutes, four seconds. It shows people who do air-based stunts and then lets us see a few movie clips. It’s just an ad for GoPro. The disc opens with ads for Sing, Kubo and the Two Strings, Phantom Boy and Little Big Shots. No trailer for Pets appears here. Note that although all the previews and the extras also appear on the 3D disc, they remain 2D there. It’s too bad we don’t get 3D versions of the mini-movies. 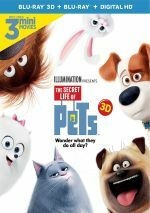 Buoyed by strong work from its voice actors, The Secret Life of Pets becomes a fun animated adventure. It offers just enough wit and charm to succeed. The Blu-ray boasts excellent picture along with very good audio and mediocre supplements. Pets becomes a likable effort.